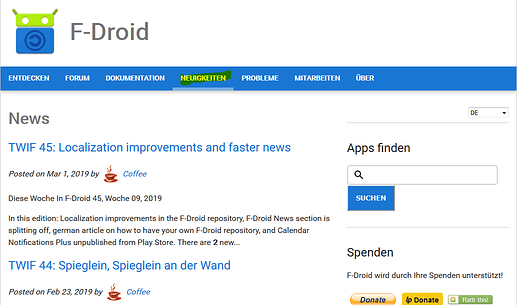 The current state of F-Froid news section and its translation is dissatisfying an needs some work. I didn’t suggest anything else. Let’s say it’s unwise announcing improvements that are half-baked and cannot be fulfilled. One makes a mockery of oneself. Looking at the dates, this situation arised later, and yes that’s unortunate. faster news is on https://news.f-droid.org. That is current. @critdroid what do you think about translating the news section via merge request rather than via Weblate? I think that workflow could work better for the news section. There seems to be no RSS Feed on news.f-droid.org. And the RSS feed from the main page stop at the 26th March 2019 (“The Latest Tab now highlights good descriptions”). Is there any current RSS Feed?